The third in our series of guides will help you create a comprehensive agreement to cover who pays for what - where you, your ex and your children are concerned. Part one (below) explains how to create an agreement that is enforceable and how to deal with financial aspects relating to children, residence and contact. Why have a finance agreement? A finance/maintenance agreement is a written record agreeing terms for parties who wish to live apart and can include terms about division of money, property and time with children. It is very important that specific dates and amounts are agreed in writing. A useful way to avoid the expensive, stress and time of litigation, especially where couples are able to have civil discussions and wish to preserve good relations. Addresses your wishes more specifically and give you far more control of the process. The disadvantage is that you cannot exclude court jurisdiction, meaning that either party can at any time apply for a court order. This makes it imperative that your agreement is realistic and follows a similar line to what the courts would award so that any such application would serve little purpose. How and when payments are made is really up to you in your agreement. There are two options commonly used: lump sum or periodical payment. Lump sum - this is a one-off payment from one party to another made shortly after the agreement is signed or after a particular event such as sale of property. Periodical payment - this is a regular payment made weekly / monthly etc. You may choose to use a combination of both of these methods. For example when a former joint home is sold, pay a lump sum to one party, and then pay a monthly sum in respect of child maintenance.It is common to pay maintenance monthly so that changes in circumstances such as redundancy or remarriage can be factored in. Separation and maintenance agreements are legally binding contracts. This means that there needs to be an offer accepted with the intention of creating legal relations. It is not necessary to involve a solicitor or even write down the agreement (however both are advisable to make the agreement enforceable). There are obvious problems with the exact terms of an oral agreement and who agreed what. The reason for getting a solicitor involved is that the agreement may be set aside, as with any contract, if one party is accused of exerting undue pressure on the other or misrepresenting facts. In order to prevent any such accusations, it is desirable that both parties receive independent legal advice. In order to enforce a contract, you will have to essentially sue the other party for breach of contract. The court are then able to award damages (money) to you to compensate for the breach, or could even order specific performance (make the other party perform their side of the contract). In order to instigate a claim for breach of contract in the civil courts, you will need to issue a claim form and pay a court fee. The rules of what must go in this form, the rules of what must be disclosed and the cost consequences of turning down certain types of offers, let alone the rules of civil trials are quite complex and you may need to instruct a solicitor to help you through the process. Of course this comes with a cost which will not be recovered in full from the other side even if you win the case. Therefore often the best method of enforcing a contract is for the courts to vary the agreement and order certain costs to be paid (such as child maintenance), or certain actions (such as improved child access) to be carried out. It will always be cheaper to try and preserve your agreement if possible. The first step when an agreement is breached should be to write to the other side setting out their breach (for example a missed payment) and ask that the payment is made as soon as possible. If the reply is that there has been a change of circumstances and they are now unable to afford to pay (for example illness means they are currently unable to work), it is worth trying to agree a revision of your agreement, as the court are not going to enforce a payment against someone who can genuinely not afford to pay it. It is always advisable to keep a note of any payments missed, so that you can advise the other party of the money still outstanding. You will then have a record of exactly what should have been paid and when if the matter does have to proceed to court. There is a difference between a missed payment and a slightly late payment however, and it is not worth accruing legal expenses over payments arriving a couple of days late. Remember to be reasonable and discuss matters with the other party if you need them to stick to a very specific date. Alternative Dispute Resolution methods are discussed in further detail later in this guide. Identify the parties to the agreement clearly - you could use a heading of 'separation agreement between John Smith DOB 25/08/54 and Susan Smith 12/05/57' or at the end of your agreement after the signature give your printed names, DOB and address. Set out the obligations of each party clearly - perhaps arrange obligations in sections such as 'children's residence and contact', 'spousal support' and 'joint savings and accounts'. Both parties need to sign the document of their own free will without any undue pressure from the other - when you sign the document, each get a witness to watch you and sign that they witnessed it, giving their name and address at the bottom of the document. State the dates that any obligations run until - is it a permanent obligation or until child reaches a certain age? What happens if one party cohabits with someone else? [Note that you can't exclude court jurisdiction so any permanent obligation will only last until any court order varies or confirms it]. You need to consider who your children will live with. It is quite normal to share residence, but remember that children need stability and it is not always practical for them to keep switching residence every few days. You also need to consider how children of school age will get to and from school to wherever they are resident. In your agreement mark exactly when your children are seeing each parent / their families, where they are staying each night of the week and how they will get there. You may then want to create specific arrangements for school holidays (e.g. allow one parent to have the children for two weeks in order to go on holiday). You also need to consider who children will spend important religious holidays such as Christmas / Eid with; is this going to alternate yearly? It is always sensible to insert a clause in your agreement addressing what will happen to residence arrangements in the event of one parent being unable to look after the children for the night (e.g. on a business trip or in hospital overnight). It may be that the children's grandparents or an aunt or uncle can care for them but it takes pressure off emergency situations if you have discussed this in advance. Non-resident parents must pay maintenance for their children. This can be agreed in your maintenance agreement. However the amount paid should be realistic and in line with the Child Support Agency (CSA) awards. Child Maintenance is paid until at least the child's 16th birthday. It may then continue for up to another three years if the child is in full-time study of over twelve hours per week. [For more information on how the CSA calculates child maintenance payments see Child Support Payments: A Downloadable Detailed Guide. Your agreement may want to address who will pay these costs (and in the event of expensive optional school trips who will decide whether your child can go). How much detail you go into is up to you but will largely depend on how old your children are as you may not know what hobbies your child will pursue if they only very young and have not yet started school. It is also worth considering what you will do if either of your circumstances change (for example you become redundant and can't meet your payments). You may simply want to agree to reconsider payment amounts in the event that circumstances change as by their nature these events are often not foreseeable. Communication with your ex partner is extremely important where you have ongoing duties to each other. This is never truer than when you have children together. It is therefore sensible to exchange contact details such as phone number, address and email. However you need to keep updating the other party should these details change, so it is useful to include in your agreement a provision to notify each other of any changes to your contact details. You may also want to agree that any important decisions affecting your children will be discussed with the other party (for example what vaccinations they have). It is hard work to define exactly what constitutes an important decision, but if there are any foreseeable decisions you both want to discuss in the future you can specifically name them. Remember that this agreement is YOUR agreement so incorporate whatever details you both agree are important to you. We know that some of the dads on here don't have much spare cash. So we are offering the downloadable guides for free. 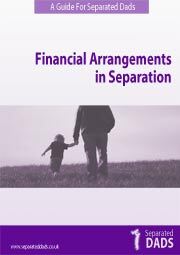 You can Download The Financial Arrangements in Separation Guide Here. We hope that we can help you in some small way with your Finances in Separation. Hey,We are at our wits end, my new partner has a daughter of 4 from a previous marriage. She is making it incredibly difficult for my partner to see her. She will not allow me to meet her and is blaming me for taking my partner away from their little girl. She ended the marriage, she is calling me every name under the sun although has never met me, I am desperate to meet his little girl, I have 2 slightly older children of my own and she would absolutely love my little girl. I lived 100 miles from my new partner and we have decided to move in together. My partner is heavily conflicted as he is not going to see his daughter as much, every time we try and fight her she threatens him with defaulting on finance he took out for her when they were married or saying he won't see his daughter again. It's very frustrating as all we want to do is move forward but can't, is there anything that we can do?? Unfortunately, your partner's only recourse is to suggest mediation or to apply to court if no agreement can be made. Please see the link here . Hey, We are at our wits end, my new partner has a daughter of 4 from a previous marriage. She is making it incredibly difficult for my partner to see her. She will not allow me to meet her and is blaming me for taking my partner away from their little girl. She ended the marriage, she is calling me every name under the sun although has never met me, I am desperate to meet his little girl, I have 2 slightly older children of my own and she would absolutely love my little girl. I lived 100 miles from my new partner and we have decided to move in together. My partner is heavily conflicted as he is not going to see his daughter as much, every time we try and fight her she threatens him with defaulting on finance he took out for her when they were married or saying he won't see his daughter again. It's very frustrating as all we want to do is move forward but can't, is there anything that we can do?? Hi There. My ex partner left the Isle of Man on my return from the University of Cape Town to do a year out post grad having taken my 5 year old boy with me. Having been disclosed of the correct ammount of maintenance to pay & having done so for a couple of years, during my studies abroad, he opted out to no longer pay the correct maintenance for my boy; although not paying any maintenance for several months, then came forward to be paying a lesser 'token' amount. Despite my various undertakings with various lawyers in the IOM, the level of service is no less than inefficient, void the right to have use of the previously called CSA in the UK. My boy's father is pleading 'poverty', yet in his disclosure to the supervised contact centre, is paying a hearty sum of rent towards his new female's mortgage, which I can only calculate is a lot more percentage in comparison to his legitimate dues to my boy. Please confirm that ex's can increase their 'lifestyle' aka rent liabilities and associated lifestyle 'in London' as a precedence before (what seems to me as a set percentage of net or even gross income) before child maintenance. Child maintenance is based on your ex's income, not his expenditure. @tigger - it would be more advisable to pay to have this drawn up by a solicitor. You don't say if you are going through a divorce, but if you are and opt for a clean break divorce then he will have no claim once everything is finalised. Otherwise, I suggest making sure any letter drawn up is officially overseen.